Online Sales Policy - Countax tractors will be delivered personally within a 50 mile radius from one of our three depots either Winchester, Windlesham or Liss. They are delivered by one of our own staff and handed over personally to the customer, complying fully with the manufacturers guidelines. If you have any questions regarding delivery or machine handover please don't hesitate to contact us on 01962 892466. Countax tractors are designed and made in Britain to meet the demanding conditions created by the British climate. 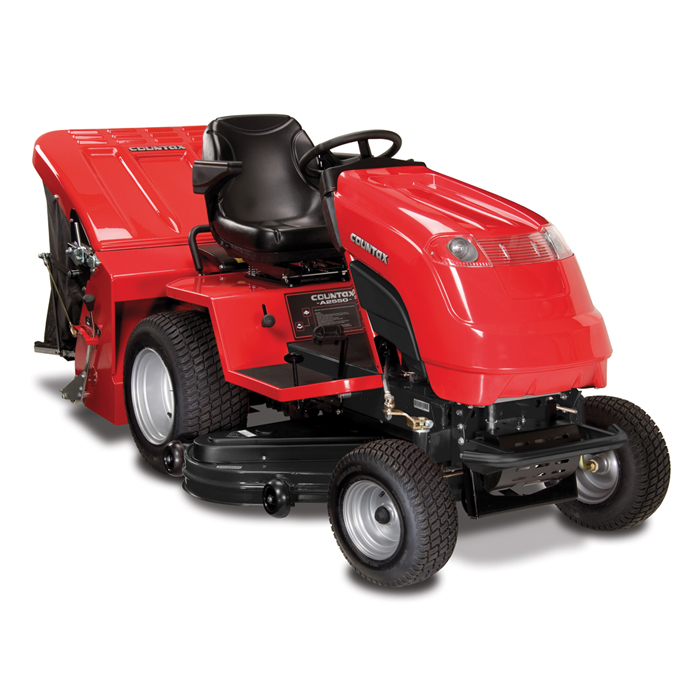 There is no finer tractor than a Countax lawn tractor for closely trimming and striping a fine lawn and collecting even the wettest of cuttings. A Countax tractor will also sweep leaves in the Autumn, cut longer, rougher grassed areas and tow a wide range of garden tractor attachments. The Countax A2550HE gives you all the Countax performance advantages in a larger, more powerful Countax tractor. The Countax A2550HE boasts a larger heavy duty chassis and heavy duty transmission and has the larger 390 litre electric lift and empty collector. Kawasaki 726cc engine - Renowned worldwide for their reliability and performance, Kawasaki only build premium-grade engines. The FR541V is a 603cc air cooled, 4-stroke engine. Operating Management System (A25-50HE) - The Operating Management System (OMS) on the A25-50HE is designed to help you get the best performance from your tractor. Electric lift and emptying - The electric lift and emptying of the Powered Grass Collector minimises time and effort. It’s available as a standard fitting on the larger A25-50HE and A230D. Differential lock - Differential lock (diff lock) is a standard feature of both the A25-50HE and A230D garden tractors. Manually engaged power take-off - The power take-off (PTO) enables a variety of powered attachments to be run by utilising the power of the tractor’s engine. Hydrostatic Transmission - The hydrostatic, foot-controlled transmission found on all Countax tractors is smooth and responsive. It is as easy to operate as the controls on an automatic car. Deck height selection - The lightweight deck height selector can be adjusted through nine incremental settings to provide a cutting height of 12mm to 101mm (dependent on type of deck). Noise reduction - All Countax products are designed to produce the lowest levels of noise. Not only does this make operating a Countax more comfortable, it also ensures that our products fall within the levels issued by EU noise legislation. Park brake - The Countax park brake system is a cleverly designed safety feature. It prevents the tractor from starting unless the brake is engaged. This important safety device is fitted as standard on all Countax models. Bullbar - Every Countax garden tractor is fitted with a bullbar. This tough tubular bar is bolted to the tractor’s chassis and is positioned in front of the bonnet. It helps to protect the tractor from accidental impact damage.